Vacation eating is different from everyday eating, but if you treasure your health and you think and live healthier, cruising or any vacation will be a healthy experience. 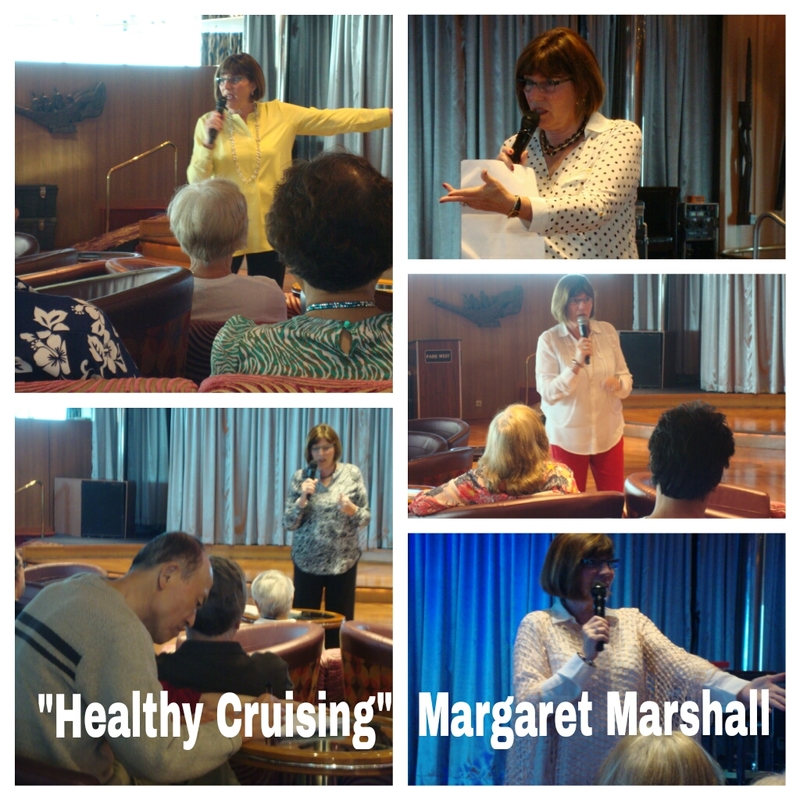 I just returned from a ten-day cruise where I was the guest lecturer presenting a six-part wellness series on board. My husband and I love to cruise and this was our 30th cruise. This time since it was a working vacation, I looked at my fellow passengers quite differently. I met with the activities planner upon arrival to the ship. In our preliminary meeting I learned that my programs were scheduled for 9:00 AM, six out of the ten days on board. My original thought was, "Who will get up and attend a program by 9:00 AM six out of ten days on vacation? I was convinced I would be speaking to myself each morning. But I was prepared with my programs and anxious to meet those who chose to come. The first day at 9:00 AM I had about fifteen people attend. I thought, this is fantastic...there is an audience! Fifteen passengers out of 3,000 came. Each day my program title and my name appeared on electronic boards around the ship and in the cruise line's printed itinerary left in the stateroom the previous evening. Each morning it seemed the audience doubled. Attendees told me they heard about my programs at dinner or speaking with others on the ship. By the last day, the lounge was crowded and people who told me they missed my first few programs wanted to be caught up on the information I had previously covered. I was in awe of the passengers who came each morning. They participated, took notes, spoke, and listened. My hope is that they implement what they learned as they returned home. What I found so interesting was that my audience was comprised of healthy individuals. These are the traits that I noticed from those attending my seminars and others on board like them. If you are wondering why there is such a big dichotomy of passengers on board a cruise ship, consider the population of our country. If you live an unhealthy lifestyle at home it follows you on vacation, but if you have healthier habits, that too will follow you while you travel. Learn every tip and technique you can to help with your healthy lifestyle. Not all of them will be a good fit for you, but listen and experiment. One thing to remember as you return home after a vacation is to get right back to your normal eating patterns. Vacation is over until next time!